The PTZ IP-based underwater webcams use a proprietary self-cleaning technology called CleanSweep™ that virtually eliminates algae and microorganism accumulation on the camera housing. Under normal circumstances this accumulation presents itself in a matter of hours, greatly reducing optical clarity and compromising the viewing experience. Quality video and the option to add ultra wide angle optics. Resolution options available up to 2048 x 1536. With daylight color correction lenses available, the HD-StaticCam Series underwater webcams offer unrivalled video quality. When cabling instruments to land is not feasible, many of our customers look for offshore fixed structures to install a Remote Powering and Network System (RNPS) that can provide power and wirelss communication to an onshore LAN. Our spar buoy line of products provide a floating structure for attachment of a RNPS and battery enclosure. The HD54-PTZ-CS2 underwater camera system employs a proprietary self- cleaning camera housing. This feature greatly reduces, and virtually eliminates, algae and microorganism accumulation on the glass housing. Under normal circumstances this accumulation presents itself in a matter of hours, and greatly compromises optical clarity. 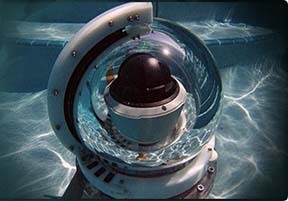 View Into The Blue self-cleaning CleanSweep™ underwater webcams give clear, very low maintenance, continuous live IP-based streaming video and data for use by researchers, resorts, governmental agencies, educators, non-profits, and the public. We believe in building partnerships, supporting research and technology, and making the ocean visible to everyone. Our underwater webcam systems are designed to be ready to connect and stream live, high-definition video and data from any web-enabled device at any location around the globe with as little work on site as possible. 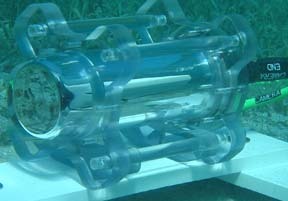 The LED-Underwater-Series offers extreme illumination in two model sizes. Available in two models, offering 120-145 degree spread and luminosity output of 3700-7400 lumens, these lighting instruments emit sufficient longer wavelengths for optimal underwater color restoration. View Into The Blue™ Science Nodes offer a suite of low cost probes that measure a variety of water and atmospheric variables over an IP network. Our systems provide live streaming data available to any web-enabled device anywhere on the globe..